Slow-worms are not snakes they are limbless lizards. These reptiles like to bask in the sun. Because they feed on slugs and worms they often can be found in long grass. The females give birth to live young (viviparously). In the days leading up to birth the female can often be seen basking in the sun on a tarmac road. They are common in gardens and can be encouraged by placing black plastic or a piece of tin on the ground. On warm days one or more Slow-worms will often be found underneath these natural radiators. Adult Slow-worms grow to be about 50cm long. In common with most lizards the Slow-worm can shed its tail in order to escape from a predator. The tail regrows but seldom to its former length. 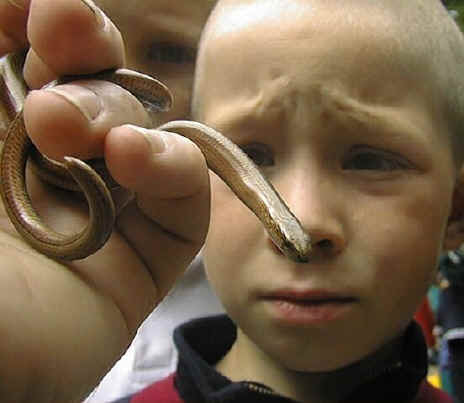 Unlike snakes Slow-worms have eyelids. The female often has a stripe along the back and the male may have blue spots.